Union regulations have recently changed in Chicago in the McCormick Place and the Navy Pier (governed by the Metropolitan Pier & Exposition Authority – MPEA). Hotels and the Donald E Stevens Convention Center (formerly the Rosemont CC) remain under the older, more restrictive regulations. In the past, any use of a forklift or other equipment required that a full crew (typically of 3 men) be hired along with the equipment. Now the crew at MPEA facilities will be assigned based on the size of the job. However, since even genie lifts must be operated by a Teamster (they cannot be operated by your labor crew, as in most cities) it is not economical to use genie lifts in this city. Teamsters handle freight, except machinery. Machinists assemble and level machinery and conveyors. Riggers un-crate, un-skid, position, re-skid and clean all machinery. Exhibitors may carry in small boxes or pop-up booth properties, as long as they can be hand carried. They may also hang signs using tape or other fasteners that do not require tools or ladders and can be completed in less than ½ hours’ time. Exhibitors may skirt tables without staples, snaps or Velcro. The legislation contains an expansive definition of the type of work that Show Managers and Exhibitors may now perform within their booths. The legislation also charges the Authority with the responsibility for ensuring that the exercise of these rights by Show Managers and Exhibitors is consistent with training and safety requirements. McCormick Place will no longer charge for the tear-out of booth-work or meeting room work performed by McCormick Place electricians. 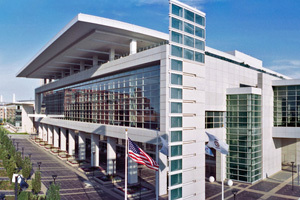 This change specifically excludes rigging or other work which is classified as Theatrical or Stage Production Theatrical and Stage Productions For theatrical and stage productions including rigging, and general session, performance, or stage work, McCormick Place will continue to charge for tear-out labor. Monday through Friday, Saturday, Sunday , and Holidays – 6:00 a.m. to 10:00 p.m. ST for 1st 8 Consecutive Hours and OT Only After 8 Hours OT for 1st 8 Consecutive Hours and DT Only After 8 Hours DT 10:01 p.m. to 11:59 p.m. OT DT 12:00 a.m. to 5:59 a.m. If you would like to receive a free quote for you trade show exhibit installation and dismantle in Chicago, please call us at 1-866-685-8950 or complete the form below to have someone reach out to you.